The subject piece of Land in Pyla Village is located at the north side of Larnaca town and within walking distance to the centre of the village. Specifically it is just 1400 meters away from the Pyla Village centre and 2km way from the Beaches. The land has a total area of 8027 square meters. The Tourist area by the beach (Dhekelia Road area) features a strip of hotels, restaurants and other entertaining facilities all by the beach. The land is ideal for the development of a deluxe complex of villas or for a deluxe complex of apartments. 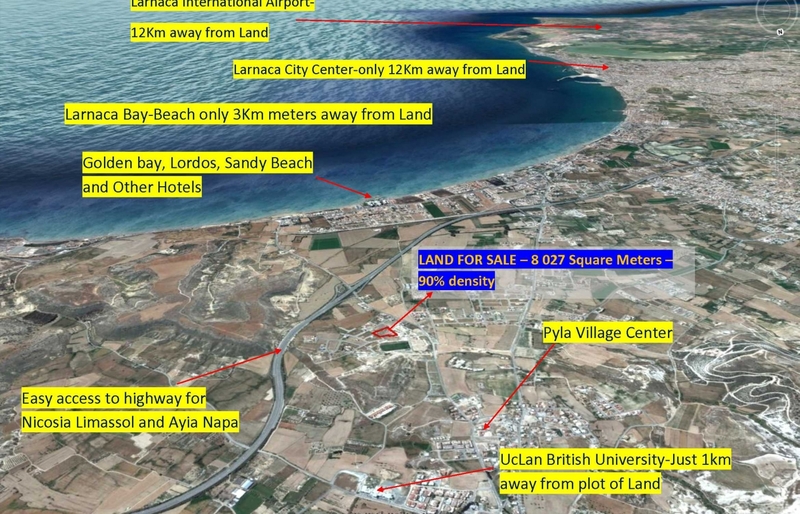 The Land is located in Kouria area in Pyla Larnaca with easy access of the highway Larnaca – Ayia Napa – Nicosia and just 2km away from the Beaches. a) Physical characteristics – the land is of total area of 8027 square meters (Eight Thousand and Twenty Seven Square meters). It has a flat surface and is vacant of any buildings or other structures. The area has been developed during the last 10 years with exclusive villas. The Land is for sale at €750 000 plus VAT.